Not many feelings compare to the one you get when, with thirty-five miles of running to go, you reach behind you for a drink of water. And realize your water bottle isn’t there. Running the Bear Chase 50 miler was somewhat of an impulse decision. Located in Bear Creek State Park in Lakewood, CO(www.bearchaserace.com), it was a mere fifteen minutes from home. With a price tag of $65, it is cheaper than most marathons I’ve run. 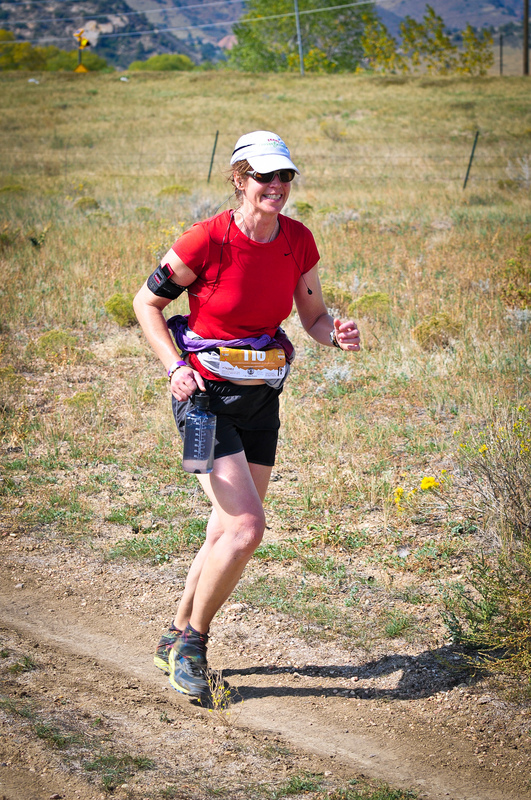 Besides, I was still smarting from missing the last fifty miles of Leadville. Nicely organized, the 50 mile runners began right at 6:30, with the 50k, half marathon, and 10k starting at intervals after. While the trail never felt crowded, there is something demoralizing about watching runners fly by, even knowing their race is half or less the distance. The second loop was a bit more solitary, making it easier to settle into a pace, but also meant there was no one around to let me know my water bottle had slipped the bonds of my waist pack. The morning cloud cover had kept the temperature a pleasant 60ish degrees, but it was threatening to warm quickly. I didn’t mean to sound quite as panicked as I did when Randall, the photographer from Running Guru, asked how my race was going. He dug in his pack and pulled out his spare bottle. A Nalgene never looked so beautiful. At the end of the second lap, I handed back the bottle, grateful and hopeful mine was still on the path. I was saved by a thoughtful spectator in case it wasn’t. As luck would have it, it was still there. Most GPS devices have a battery life of ten hours or less. My beloved Garmin 310XT has twenty. Three runners had given up finishing in time after their devices died and their morale waned as they had no idea the time. One told me I had already inspired her to keep running just by running myself. She, I and Ben, on his first ultra, came around the last stretch together. I had “pulled” Ben up the last hill, and he repaid the favor by encouraging me to run across the finish, he last and me next to. But never mind that. A race that long isn’t about winning or losing. It is about what it takes to even show. Finishing is a bonus. Helping someone else is icing on the cake. The amazing thing about small races is that your victory is everyone’s, especially the under-applauded volunteers, who were still at the finish line, junk food and beer in hand. Thank you. Every person who loves beautiful fall foliage, gorgeous mountain views, a fun personal challenge, and an epic ski town has to do this race at least once!!!! 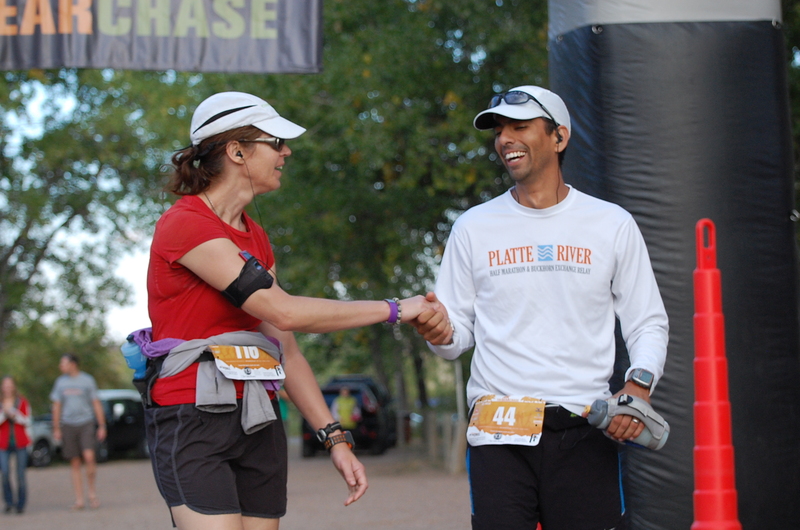 Aspen Golden Leaf Half This race was recently rated by Trail Runner Magazine as one of America’s Top 14 Most Scenic Races. This is my fifth year running this race and I will probably be running it for as long as they continue to host the event. The Aspen Golden Leaf Half trail race is a spectacular run that takes you from Snowmass into the town of Aspen on the Government Trail’s sweet singletrack. The date of this event is perfect for peak fall foliage viewing. It is always the 3rd weekend in September. The event is extremely well-coordinated and sponsored by Ute Mountaineering in Aspen. Your entry fee gets you a technical tee, a pair of Smartwool socks, and typically some Clif Blocks or some other similar schwag. Start time is a nice 8:30ish (depending on your time wave). So, let’s talk about what the race itself is actually like. I won’t lie, for the average trail runner like myself, the first 1.5 miles is a real humdinger, lung-burner. It’s 1000 feet of elevation straight up a forest service road. At this point you’re at about 9600 elevation. Once you’ve gotten past this first challenge (where you swear will you never, ever think of doing this race again), the trail is an undulating gorgeous run through aspen groves, pine forests, and across open fields that are ski runs in the winter. The views of the surrounding mountains are gorgeous and the color of the aspens across all of the hillsides is breath-taking. There is another 300 feet of climbing at about the 5 mile mark. At about mile 8, you begin a bomber downhill run for a few miles. For the last 2 -3 miles, you’re on the flats into Little Cloud park in Aspen proper. The cool part of this event doesn’t end once you reach the finish line. This is one post-race expo for which it is definitely worth sticking around. The food is always quite good and the post-race raffle is probably the best in the country. Thanks to Ute Mountaineering’s vendor relationships, there is a seemingly endless amount of raffle items for runners to win. These are no mere raffle prizes. In the past, raffle items have included BD trekking poles, Smith sunglasses, Vasque trail-runners, Chacos, Patagonia windstopper jackets, restaurant vouchers, Aspen Sky hotel vouchers, etc. Todd has won items in the raffle the last two years: one Timex watch and one Patagonia technical long-sleeve shirt. As a runner you are automatically entered with your bib number into this raffle. Just make sure you listen carefully for your number. I’m sure you wouldn’t want to miss out on a new backpack! One other note, this race generally fills up quickly so if you’re up for the challenge make sure you register early. Trust me on this one, you won’t regret it!! Have fun!! Despite the fact that in this 25 mile trail run there is about 4,000 feet of elevation gain and even in April it can be pretty toasty out on this exposed trail, The Desert Rats Fruita 25 mile event is a must race for the avid trail runner. When I first signed up for this event I naively thought it looked like a beautiful course winding through the Colorado National Monument. My brain read the 4000 feet of elevation but it didn’t really register in my mind what that was going to look or feel like on race day. Now obviously, I’m not an elite ultra-runner or anything but I do fancy myself to be a decent trail runner with some grit and fortitude. For the elite runners this course is a walk in the park. For the average trail runner, it is a beautiful, challenging course. The 4000 feet of elevation definitely got my attention on race day. The primary challenges for me were Within the first few miles, you are climbing up a mountain on a trail called Moore Fun. Depending on your mindset, this may or may not actually be more fun. The hurdle that almost brought me to my knees, however, is at mile 18 where you climb up a seemingly endless dirt road with lots of false-summits thrown in for good measure. Once you’re past that little treat, the rest is a beautiful run along the top of the ridge with great views and a downhill decent for the last 4 -5 miles. The reason this race is one of my favorites is for the reason that even though you are running up and down rollers and hills constantly, the scenery is so breathtaking and inspiring that it can help but lull you into a runner’s high. This isn’t the race with throngs of spectators lining the course with cowbells and horns. This is a race where runners begin to spread out and it’s just you, the rhythm of your footsteps, scenery that you actually want to slow down and take in, and you are inspired by nature and her beauty. I also like that the Desert Rats coordinators have taken on an environmental angle and do not have paper cups for beverages at the aide stations. The runners must bring their own water bottles or collapsible cups. Despite not having cups, the aide stations are well supported with chips, coke, orange slices, watermelon (my personal favorite), and lots of other well appreciated snacks.